Description: Fennel is a perennial herb up to 2 meters high with feathery leaves and golden yellow flowers. 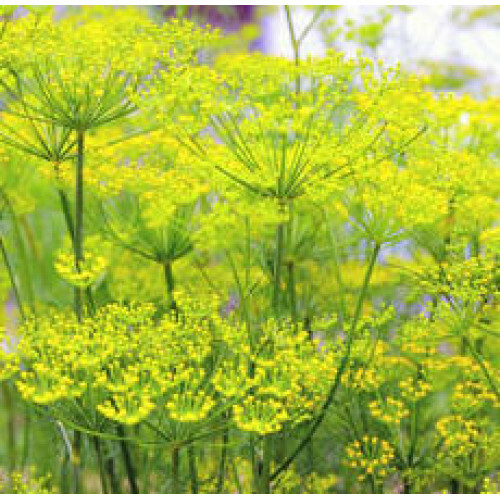 Aromatic Scent: Fennel Sweet Essential Oil has a spicy, sweet scent. The scent is similar to that of black licorice. Common Uses: Having a sweet and soft liquorice aroma that's reminiscent of anise, Sweet Fennel is used in aromatherapy and naturopathy as it is credited with being carminative, depurative, diuretic, expectorant, laxative, stimulant, splenic, and stomachic. And it is also believed to be invigorating, restoring, stimulating, and warming and hence it is also used in soap-making and cosmetics.